The Ranch Neighborhood is located southeast of Wasilla off Fairview Loop. 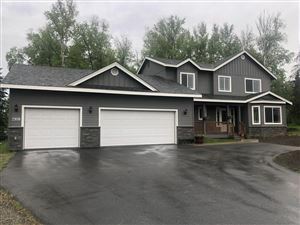 This neighborhood is a master planned community and very desired for homeowners who want quick access to the Parks & Glenn Highway Interchange for an easy commute to JBER or Anchorage as well as being only minutes from Downtown Wasilla and Mat-Su Regional Hospital. This unique neighborhood boarders a state game refuge; so you can live in a planned neighborhood and still be on the edge of the Alaska Wild. If you are looking for a home for sale in the Charlotte’s View we have all homes for sale in this area featured on MLS from ALL the Real Estate Companies. If you are looking for a New Construction Home in the Wasilla area call or text 9074404661 for availability of lots and pricing information. The listing content relating to real estate for sale on this web site comes in part from the IDX Program of Alaska Multiple Listing Service, Inc. (AK MLS). Real estate listings held by brokerage firms other than Real Estate Brokers of Alaska are marked with either the listing brokerage's logo or the AK MLS logo and information about them includes the name of the listing brokerage. All information is deemed reliable but is not guaranteed and should be independently verified for accuracy. Alaska MLS. The purchase or sale of your Alaska home is one of the most important financial decisions you will make. Whether you are moving across the street, across Anchorage, or across the country; our priority is to make your experience as stress free and as easy as possible. We promise to provide you the most professional real estate experience we possibly can. We are proudly serving Alaska home buyers & sellers throughout the entire Alaska Corridor; including Anchorage, Eagle River, Chugiak, Peters Creek, Palmer, Wasilla and surrounding areas. We specialize in first time homebuyers, new construction home purchase, Military Relocation, Foreclosure & Short Sale properties.